Saturday’s dusk draped over Isla Paradiso as a blanket did a sleeping body, though tonight of all nights the air was at least a little cooler, and the fine white sand chilled enough to sit on. Over the years, the beach had become a place of reflection for Rhea; and she supposed that was partly why she had been so drawn to Isla Paradiso. She had sat on the beach after both her mother and father’s deaths, after a particularly bad day at school. And that was where she sat now, however different this pale sand was to the Valley’s rougher, yellower sand, and however unhealthy it might look to the sim passing by. The S.S Olympus bobbed rhythmically up and down on the flooding tide, its outdated wooden hull creaking continuously as she wondered how much it would cost to see the boat sea-ready once more. Sunset Valley was no nearer than it had been the first time she’d crossed. But maybe she didn’t have to cross all the way over; there were certainly other islands along the route. What was that other one called? 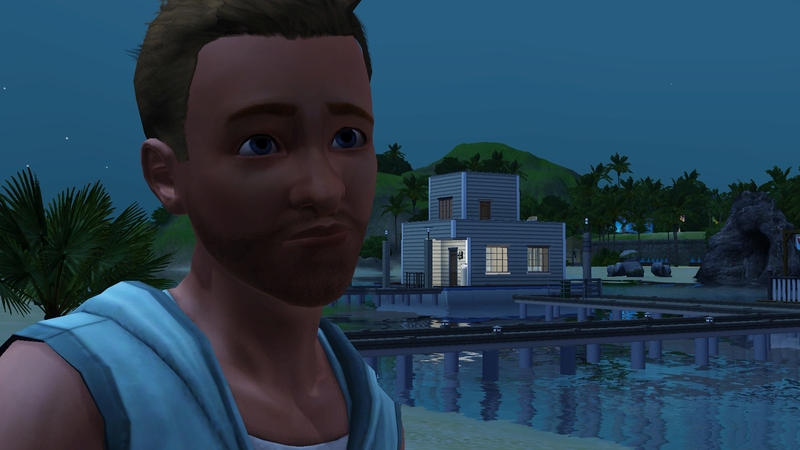 Sunlit Tides, that was it. But then, how different could two tropical Greek-influenced islands be? The cycle would surely repeat itself, and she’d end up heading back to the mainland anyway. The Valley, Twinbrook, Bridgeport. All the same in retrospect, it would not really matter which she chose. “Rhea?” came a small, concerned voice from the empty beach behind her, but Rhea did not acknowledge it, there was no point in it anymore. Where had listening got her? The figure hesitated and she felt it sit down beside her. A man’s body, a man’s voice; Alex. “Mum told me what happened. What a b****,” he remarked, looking hopefully into her eyes, and this time Rhea returned his gaze. He was in his gym clothes, and an empty plastic energy drink bottle sat behind him in the sand. Silence fell on the couple again as both scrambled to find the appropriate words. “I can’t do it anymore,” Rhea whispered more to herself than her peer, but Alex looked at her sadly all the same; the water by now creeping up to the soles of their sanded shoes. Dark clouds began to gather over the distant mists, which appeared to reside there permanently despite the hellish weather they’d been experiencing of late; and even Rhea had known of the Kraken legend as a child all the way in Sunset Valley, and the tale was not just told from her mother’s lips. The swell of the tide lapped against the sand at their feet, wetting the rubber underside of Rhea’s cheaply-bought pumps. Rhea laughed despite the pathetic simplicity and cheesiness of the metaphor. Maybe someone did care. Maybe. A sudden yet distant outbreak of thunder rattled the horizon over the rolling floods, instantly lightening the humid air around them. Her far-flung gaze, formerly focused on the filling skies snapped back to the man beside her, and a smile curved around the edges of her mouth. Their eyes met but a second before their lips did. Minuscule droplets of precipitation speckled the whiteness of the sand, washing the heaviness of the light breeze surrounding the islands, and Isla Paradiso’s quiet state came alive with the pitter-pattering of rain.